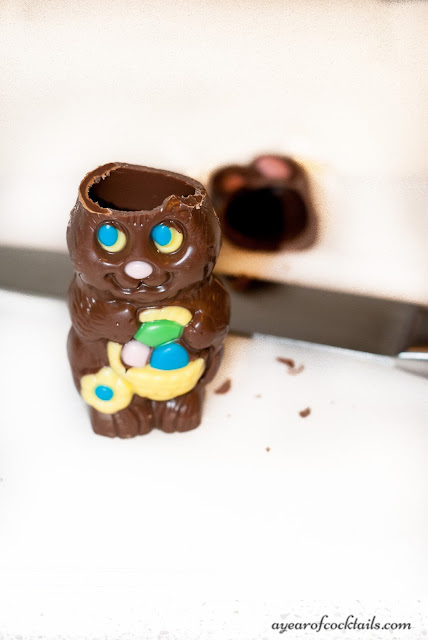 Don't you just love those adorable hollow chocolate bunnies that come out around Easter? That was the one thing I ALWAYS looked forward to when Easter was approaching. 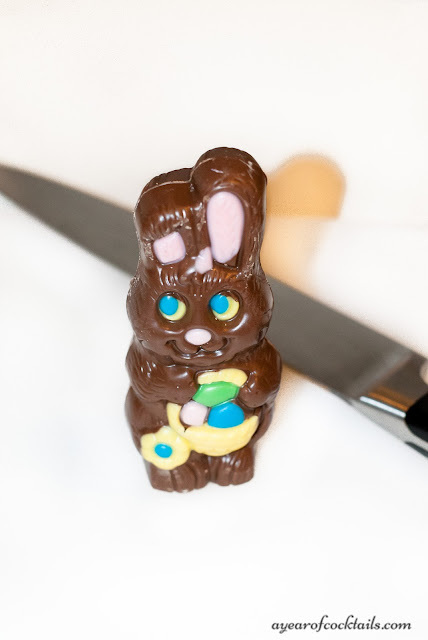 Now that you're an adult, you ever wish there was a little more to those bunnies? Like alcohol? Believe it or not we only have 3 days left until Easter. Anyone else think it's kind of funny that Easter and April Fools Day are the same day this year? HAVE YOU SEEN THE MEMES?? You know like the ones where they remove the little chocolate eggs from the foil and wrap grapes in the foil instead? OH, what about the one where they make "cake pops" out of brussel sprouts? OMG! 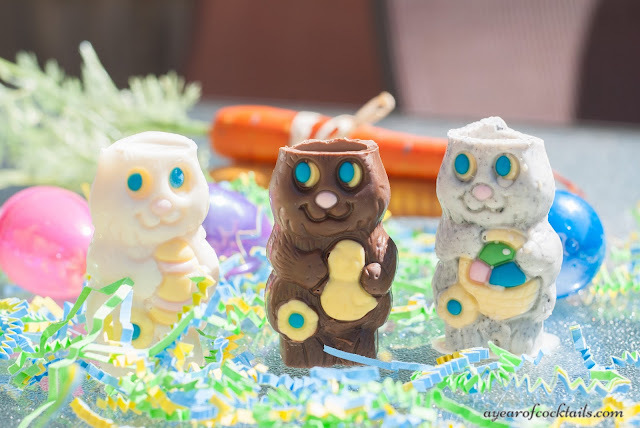 We are hosting Easter this year and I am DYING to do something like that! I know me........I totally won't do it, but the idea of wanting to cracks me up! 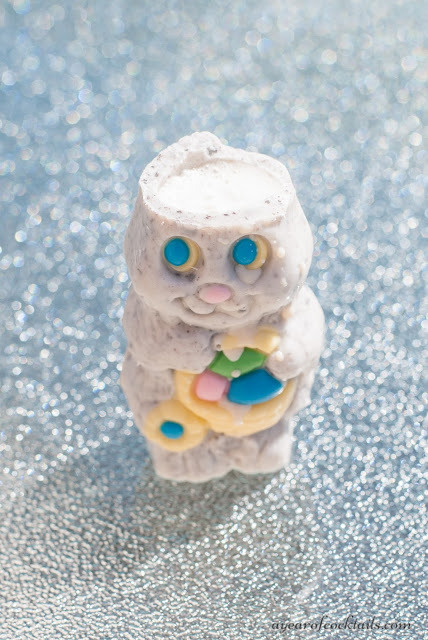 What's on the menu for Easter? We're serving ham, mashed potatoes, creamed corn & brussel sprouts (hee hee). We also have family bringing fresh sourdough bread, cauliflower and for dessert FLAN!! My Mother-in-law makes the BEST flan ever and I'm soooo excited that she's going to be making and bringing it on Sunday!! Back to these little guys. 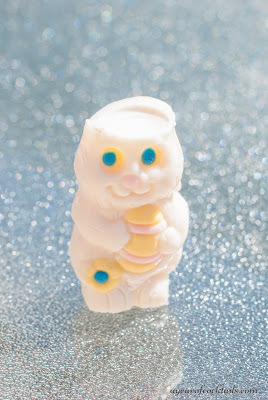 Did you know that they come in white chocolate and oreo cookies and cream? WHAT?!?! How fantastic is that! I must admit, when I had to cut off their ears, I felt sad for them.......but then remembered that I'll be putting alcohol in them and then that feeling went away. 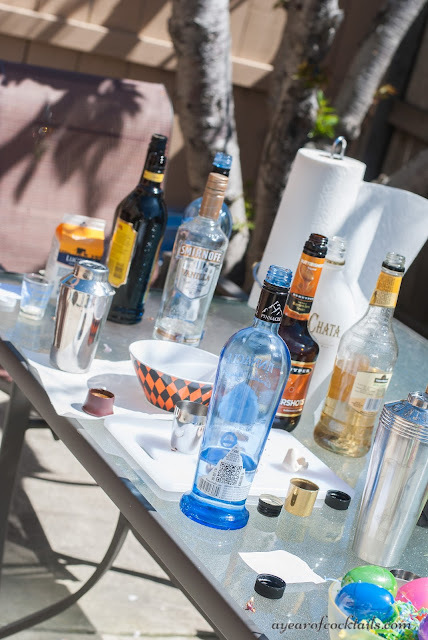 I've got to say, the line up of alcohol I had set out to make these three different recipes looked quite delicious....and quite a bit like I've got a problem, haha. I was thinking, what if someone walked into my backyard while I had all of these bottles lined up....in the morning. I got over it and mixed, shaked and poured my cocktails into these little guys. Although I do always wonder........what exactly they're looking at! 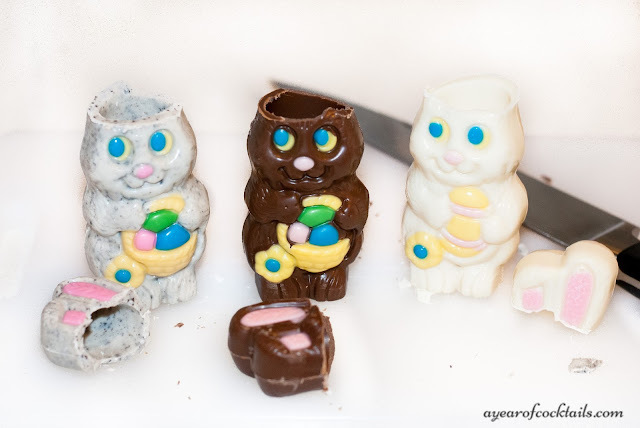 Here's a tip: Make sure your bunnies DON'T have any holes before pouring liquid into them. In a shaker, add ice and all of the ingredients. Shake and strain into a chocolate hollow bunny. 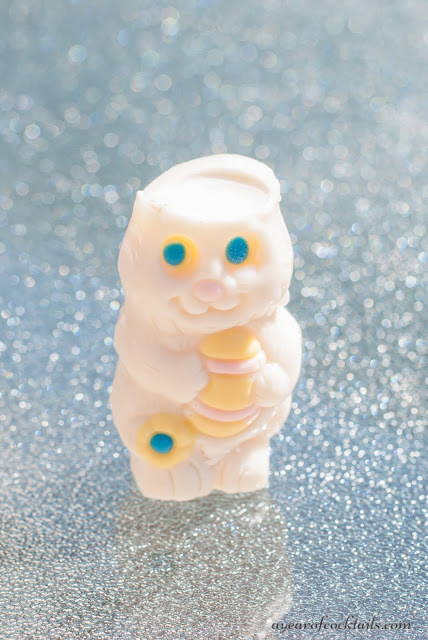 Shake and strain into a white chocolate hollow bunny. 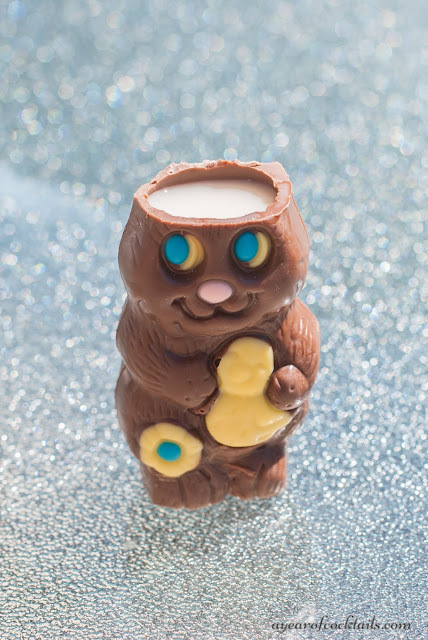 Shake and strain into an Oreo cookies and cream hollow bunny. There they are! 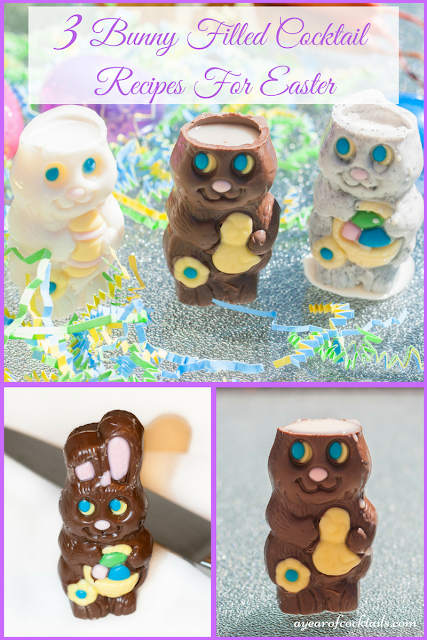 3 Hollow Chocolate Bunny Filled Cocktail Recipes For Easter! I will admit these little guys hold a lot more liquid inside of them then I would have thought! Which in my book is a win-win! One more thing. Did you notice? 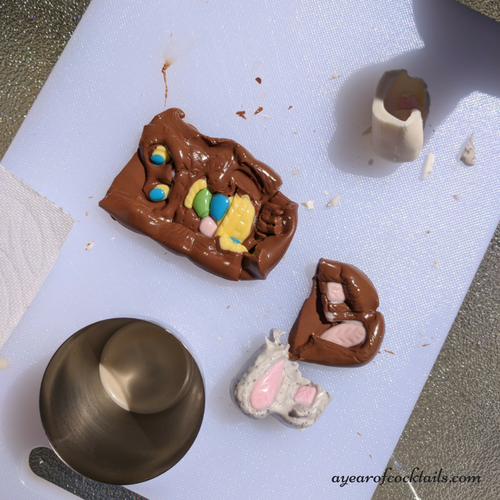 Did you notice that the chocolate bunny that I ended up with was not the same one I started with? Good thing I bought extras!! I hope you have a wonderful Easter filled with family, friends and of course COCKTAILS!! Ha ha - this is awesome! I love this idea! 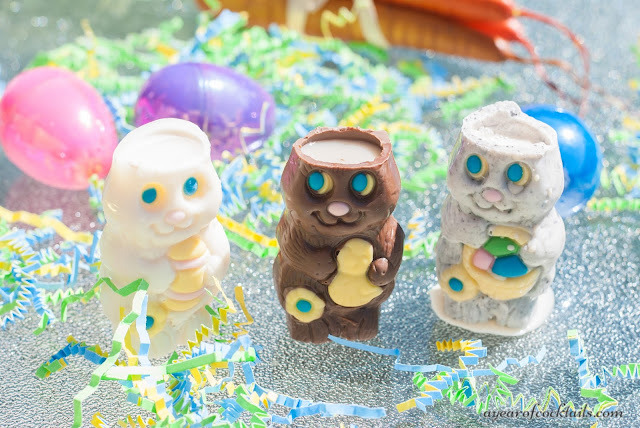 So perfect for our Easter party. Now to decide which alcohol to use, so many choices. I think I need to stock up on bunnies. This is such a ridiculously cute idea! I love it! I definitely want to do this now. Yes, I'm going to have to try these! 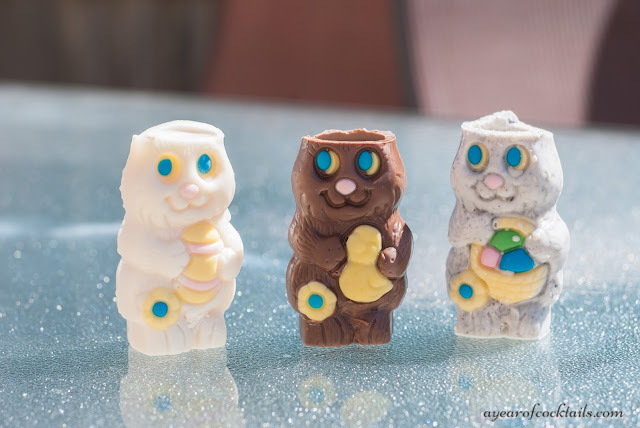 What a perfect way to use those hollow bunnies! Thanks for sharing.